Exfoliation Dome is not just a crag, but a mountain peak with no simple route up or down. The main faces on the dome are called Blueberry Hill (facing west) and Witch Doctor Wall (facing east). Somebody named Beckey first climbed it in the ’70’s via the steep northeast face, one of the most imposing walls in the Darrington area with the added reputation of being covered in bushes, lichen and general filth. This reputation is not entirely deserved. Mr. Beckey pronounced the Dome “quite possibly the most difficult 4,000 foot peak in the State of Washington” and he is probably right. However, the West face, called Blueberry Hill, is less steep and also less vegetated than Witch Doctor Wall where Beckey went; most of the climbs presented here lie on the Blueberry Hill side. To reach these climbs, park about six or seven miles from the Mountain Loop highway on the left fork of forest road 2060, just past the second of two rocky washes that cross the roadbed (in July, 2010, both were passable without 4 wheel drive but bushes were encroaching the roadsides so you might scratch your car near the end). Scramble up the “Granite Sidewalk,” a 1500 foot high avalanche path on treacherous slabs and try not to slip! This classic climb involves exposed scrambling and some bush crawling in addition to up to ten pitches of relatively low-angled cracks, flakes and slab climbing (the pitch-count varies, depending on where you set belays). 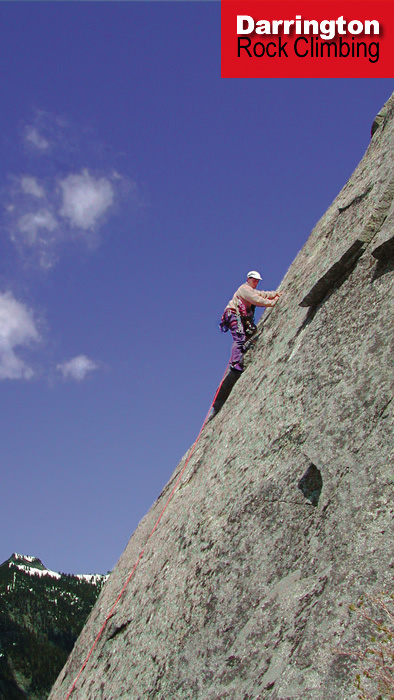 Approach it via the Granite Sidewalk and start the technical climbing with a 5” crack above a three-foot stump where the ridge begins to steepen at the base of the buttress itself. Rack: gear to 3 1/2”. This excellent slab climb is sustained, but generally well-protected, and starts below and left of the base of the West Buttress route. To find the climb, head left from a 15 foot stump that is perhaps 100 feet below the one noted above, and walk about 100 feet to a point where a bolt can be seen above a v-shaped overhang about 15 feet off the ground. Rack: gear to 3” and ten draws. Eight pitches lead to the Blueberry Terrace. Steeper cracks and corners are included in addition to the sustained slab climbing. This excellent climb is the most challenging of the routes presented here. It is further left and starts a little lower than Dark Rhythm; and may be reached from the latter via 100 meters of grassy ledges, some tricky scrambling (down), and (frequently) wet slabs or from an approach along the base of the rock (safer but bushier). The route starts in a bush on a ledge just off the ground on a short, steep wall with a bolt visible about fifteen off the ground; a large overlap is about 20 meters above. Rack: gear to 3 1/2” and 13 draws. Seven pitches lead to the Blueberry Terrace. This exciting climb starts out on the slab apron below the West Face of the Dome and ascends cracks and dikes on a rounded buttress about 1,000 feet north of the West Buttress. This climb is best approached by hiking/bushwacking/scrambling northward along the base of the slabs, diverting left from the Granite Sidewalk several hundred feet before reaching the start of the West Buttress (the best place to cross over is just below the first point at which you can see that the strip of trees on the left side of the sidewalk is very narrow). Eight pitches of varied climbing lead to the Blueberry Terrace. The West Buttress, Dark Rhythm, Rainman and Jacob’s Ladder all lead to the Blueberry Terrace, 300 feet below the top of the dome. While some parties descend from here, the summit of the Dome is well worth a visit. To continue on, traverse down and left until the terrace begins to climb back up again (Jacob’s Ladder tops out at this point). From here, head up and left to the highest convenient belay, where there is a crack at your feet and a bush just barely within reach above (a bolt is visible 20 feet over head). Climb up past the bolt, briefly move right and then back left into a corner, and look for an exit up and right to a chain anchor (30 meters). From here climb more orless straight up, looking for an opportunity to exit left well below where you would otherwise enter bushes above. Step down and left into a shallow bowl where you can unrope, scramble up slabs to gain the crest of the north ridge shortly below the summit, and turn right. Rack: bring gear to 2 1/2”, a little nerve, and some route-finding ability. Note: the 2009 edition of Washington Rock Climbs incorrectly shows the original route from the Blueberry Terrace to the summit, a route that has not been recommended for 20 years. Print this route description and bring it along and you'll have a much better day. This moderate slab climb follows a blunt rib on the left side of the West Slabs, just right of the large right-facing corner system along the south flank of the West Buttress. To find it, begin scrambling up the gully next to those right-facing corners and look for a diagonal ledge on the right, about ten feet outside the corner. The first bolt lies about twenty feet above. Four pitches lead to a chain belay from where a descent is recommended, but continuing is possible to reach the summit of the Dome in about 4 easy but messy pitches. Gear: small selection to 2” and eight draws. The descent from the top of the dome is difficult, though perhaps not as bad as the guidebooks might suggest. If you descend to the east, three or four rappels just southeast of the summit will lead to a talus slope. From there, scramble down and left to the far edge of the talus and head back around the dome through brushy woods, eventually picking up an overgrown logging road that leads back to the Clear Creek road. The west side descents involve more rappelling and scrambling down steep slabs than the east side, but also less brush. The “West Slabs” descent is probably the most popular way off the dome, but it starts out with some messy rappels that many parties complain about. the old sling anchors on dying trees were replaced with chain rappel stations in the Fall of 2004, and the primarly remaining problem is the possibility of pulling or kicking a rock on yourself or your parther. From the summit, make a 1/2 rope rappel down and right to a chain station on a blocky ledge, and five or so short rappels follow, with the stations located ledges outside (right of) a shallow gully system leading to to a chain rappel station just off the right (north) side of a small knob above the cleaner and lower west slabs. With two ropes, some of these stations could easily be skipped but the danger of pulling rocks on your head or getting a rope stuck is probably less with the shorter rappels. From the station near the knob, another short rappel leads to a chain belay station down and right from the knob, then four clean rappels on Westward Ho (the route is described above). Scramble down the Granite Sidewalk, fifteen hundred feet of treachery. Another popular alternative is to descend to the northwest via the 23rd Psalm rappel route. Scramble down from the summit and find the first anchor in the bottom of the shallow rock bowl just below the top of the dome; six or eight rappels follow a steep trough swept by avalanches and rappel stations may be damaged or missing (though the route was intact as of August, 2003). There is then is some brush and often some wet slabs to negotiate before getting back to the Granite Sidewalk. A descent from the Blueberry Terrace may not be any easier than the descent from the top of the dome. It involves multiple rappels, opportunities for stuck ropes, and may also involve downclimbing and crawling through brush. However, rappel anchors are in place on Jacob’s Ladder, Rainman and Dark Rhythm; some old stations are also on an obscure line between Jacob’s Ladder and Rainman. Dark Rhythm is probably the least attractive of these routes for rappelling: it eats ropes. Many parties rap from a tree at the south end of the Blueberry Terrace to reach low angle terrain and some screwing around to get on the Westward Ho rappel route. An old rappel route goes straight down from a tree with slings on it near the north end of the Blueberry Terrace and a newer rappel route follows on or near Jacob’s Ladder, starting from a chain anchor 100 feet north of that tree, on the lowest point along the Blueberry Terrace. From the fork where a spur heads left off the main Clear Creek logging road about five miles from the Mountain Loop Highway, drive approximately 1/2 mile until a small clearing allows parking on the right, immediately before an old logging roadbed can be found to head up and left into the woods. Follow this about 1/4 mile and, where it nears the creek draining the back side of exfoliation dome, follow the road cutting back right another hundred yards or so until finding a crude "trail" cutting up the bank above the roadbed (on the left). The route starts out following closely above the creek, then switchbacks before traverssing steeper slopes, heading up and left, to emerge from the woods in the boulders below the northeast side of Exfoliation Dome. Cairns mark a route starting up through the boulders. A combination of rock hopping and brush leads to the base of the slabs below Witchdoctor Wall, and the Solar Wall routes lie up and left. This historic route is not the best climb in Darrington but it provides a remarkably moderate climb on the steep Witchdoctor Wall side of Exfoliation Dome and, for those looking for a bit of an adventure and not adverse to delicate handling of the occasional loose flake or the not so delicate hauling on tree limbs, Sunday Cruise offers a reasonble outing. (Several nearby aid climbs nearby offer a "big wall" experience in this remote and beautiful creek valley and other climbing opportunites await exploration). Sunday Cruise is included here as a lost classic that has been noted in guidebooks for thirty years but has never had a detailed topo and is rarely climbed. For a retreat or descent, slings adorn bushes and flakes all the way up the climb, but there is also a bolted rappel route 100 yards to the north, shown in the topo. This is a steep rappel down a relatively featureless wall and the consequences of a stuck rope could be quite serious. If you've packed light and brought your hiking shoes with you, it might not be a bad idea to scramble over the top and head down the more civilized Blueberry Hill side.